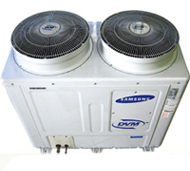 The following types of airconditioners are the more popular choices for commercial and industrial use. Mounted in the ceiling, these are often used in commercial applications as well as in upmarket homes. Like Splits, they have separate outdoor units and are extremely quiet. More frequently used in commercial and industrial applications (shops, hotels etc) or home areas from 40m² upwards, these utilise ducts to carry cooled or heated air to rooms, and have separate outdoor units. This state-of-the-art airconditioning system is most often used commercially, but is also being specified for very upmarket homes. One outdoor unit airconditions several rooms and the system is very economical in operation. Ideal for cooling/heating larger areas such as conference rooms, offices, shops etc, these Alliance Air units are available in capacities from 36 000 BTU/hr up to 60 000 BTU/hr at very competitive prices. With cooling capacities from 88 800 BTU/hr to 300 000 BTU/hr and heating capacities from 96 000 BTU/hr to 324 000 BTU/hr, these Alliance Air units are ideal for ducted airconditioning of large open-plan areas. These combine indoor and outdoor units in one package and are thus not as quiet as splits. As they require a large opening to be made in a wall, they are best suited for installations where provision is made at building design stage. Mounted over doors, e.g. in shopping centres, these provide an 'invisible curtain' of air, helping to keep indoor temperature constant and ultimately reducing the electricity consumption of your airconditioner. ©Absolute Chilled. All rights reserved.